There are spots, and then there are annoying spots that magically reappear even after you clean them. Theses bad boys can be a pain in the behind, but if you know how to clean them properly, you can stop their reappearing act. One of the major causes of this problem is called “wicking.” Wicking happens when there’s a large amount of liquid that causes the spot. This could happen with urine, soda spills or any other spill with a large volume of liquid where the liquid saturates the carpet and gets to the backing of the carpet or through to the pad. Over time the liquid will make its way up to the top of the fibers, and voila, the stain reappears. If you have your carpets professionally cleaned, then this wicking problem is not very likely to happen. Another major cause of reappearing spots is called residue spots. Residue spots are leftover residue that’s left from the spot itself or from the cleaning agent. This happens when oily residues occur, like with lotions, adhesive or from improper cleaning. It’s not quite visible on its own, but dirt and dust stick to the area, making it a visible spot that a vacuum can’t pick up. Use proper and aggressive spot cleaning techniques to get rid of residue spots. Remember that most of these reappearing spots can be removed by professional carpet cleaners; however, if they are permanent, a legitimate carpet cleaning business will tell you up front that there’s a chance the spot will not be removed. Your wooden floors should be taken care of with as much thought as your carpets, even though it seems that it’s easier to maintain. Taking care of your floors will help you save time and energy in the long run, as well as keep some cash in your pocket. 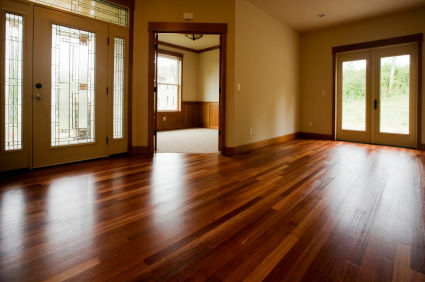 On wooden floors, you should use several coats of oil-based paint to keep it protected. The choice of the paint is important; you should pick a paint that is made for outdoor use, the type you use on decks and porches. This will help your floors be resilient to random liquid spills and the traffic of everyday steps. It will also keep your floors looking better for a longer period of time. Also remember to choose wisely on what to seal your wooden floors with. There are many types of sealers from varnish, shellac, lacquer to polyurethane. Polyurethane is the option out of the bunch that requires no further treatment. Keep in mind that the best way to clean wooden floors is to first vacuum the floor and then apply wood-floor cleaner with a dry wax applicator. Remember to keep in mind what type of wooden floor you have, in order to choose the best liquid cleaners to use. After leaving it for a few minutes, wipe away the leftovers. After the floor is dry, you can buff it with a floor polisher. Of course, if you don’t want to do this yourself, you can always hire professional cleaners. If you have the money, try to purchase genuine wooden floors instead of the alternative laminated floors. Even if they hold a nice appearance, are very similar to timber, and might be easier to clean, they cannot be refinished. Down the road, the laminated floor will have to be replaced because it can’t be refinished.